Even if your toilet looks clean, it can be full of germs you can't see. 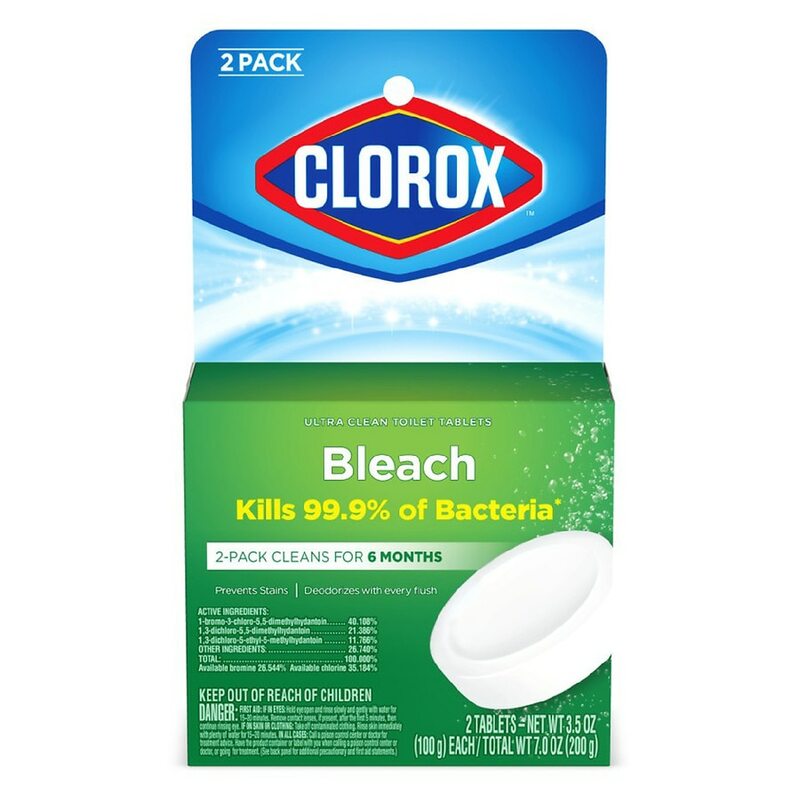 Clorox® Automatic Toilet Bowl Cleaner helps deliver Clorox bleach with every flush, to help kill 99.9% of common household germs in toilet bowl water. This easy-to-use tablet works day and night to help keep your toilet clean and deodorized. It also repels tough hard water, mineral and lime-scale stains, for promoting a brighter toilet bowl in between regular cleanings. Simply drop it in your tank and let it get to work. Each tablet in this convenient pack of 2 lasts up to 3 months. With Clorox Automatic Toilet Bowl Cleaner, a fresher, cleaner toilet is only a flush away. For best results, clean toilet bowl thoroughly, including under the rim. Cut open pouch. Do not touch tablet directly. Flush toilet. When water level in tank is low, drop tablet into tank near side wall and away from water valve opening. When tablet has dissolved, simply add a new Clorox Automatic Toilet Bowl Cleaner tablet to your toilet tank to help keep your toilet clean and fresh. Tablet should be used in toilets that are flushed daily. Each tablet's lifetime may vary. Caution: Highly corrosive. May be fatal if swallowed. Do not take internally. Causes eye and skin damage. Irritating to nose and throat. Avoid breathing dust. Do not get into eyes, on skin or clothing. Wear rubber gloves when handling and wash thoroughly after handling. Keep out of reach of children. Physical and chemical hazards: Strong Oxidizing agent. Keep away from heat or flame. Mix only with water.